Have I ever mentioned how much I love Hainanese Chicken Rice? 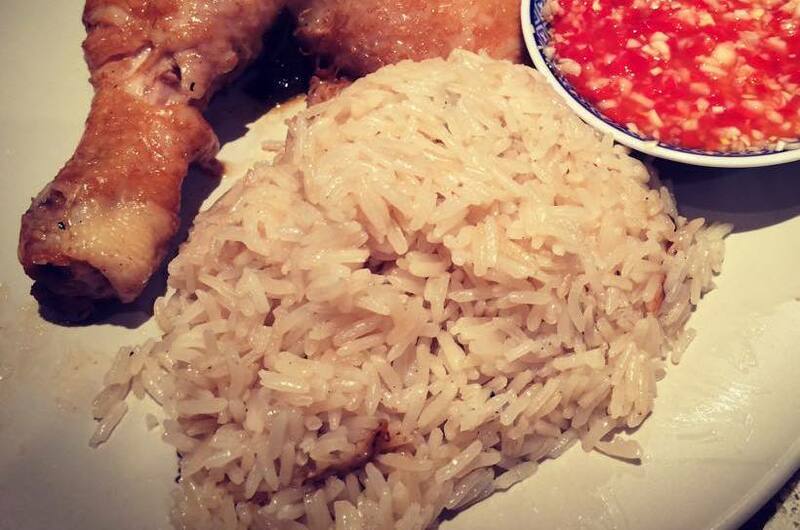 There's something about this classic dish that makes me want more, and I believe it is all because of the rice. See, a bowl of jasmine rice is great on its own, but what if you infuse it with sesame oil, ginger, garlic and chicken stock? It's great, I tell you. The secret in making a good fragrant garlic-ginger rice lies in chicken fat. Don't know what to look for? It's usually the white, rubbery bits that mostly found around the chicken thighs. Fry the chicken fat over high heat until it shrinks and dries up, and you have chicken oil., which forms the base for frying your aromatics, which are garlic and ginger. Once fried until golden and the fragrant is released, you will drooling in anticipation for the finished dish. If you're not a fan of rice, you will be after a mouthful of this delicious concoction. Service it with poached chicken or Soy Sauce chicken and you will be guaranteed a hearty and satisfying meal! To cook the rice, heat the oil and reserved chicken fat in a large non-stick saucepan over medium heat. When the pieces of fat have shrunk considerably, add the garlic and ginger and sauté until fragrant and slightly golden. Once the aromatics are fried until fragrant, add the rice in the sauce pan and stir it occasionally. Toast the grains for a few seconds. Add the salt and chicken stock, stir and bring to a boil. Reduce to a simmer, cover and cook for about 10 minutes or until the surface is dotted with pits, and no liquid is visible. Reduce to the lowest heat and cook for another 10 minutes, then turn the heat off and rest for 15 minutes before uncovering and fluffing with a fork. Serve it with poached chicken or Soy Sauce chicken.